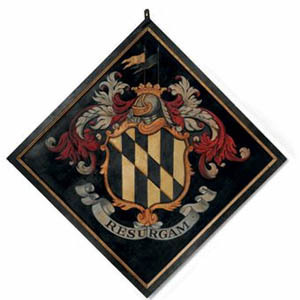 A hatchment is a distinctive rendering of a dead person's arms, represented on a lozenge (not lozenge shaped arms, but arms painted within a lozenge shaped frame). This feature is enough to indicate that the rendering is a funeral hatchment, but there are often other clues. The crest or helm may be replaced by a skull and the motto may be replaced by a reference the death and resurrection. The background is black or in some cases black and white (the significance of which is explained below). Sometimes symbols of time, such as a sand-timer or arrows, may be shown on the background. A cherub is sometimes shown at the top or bottom corner. 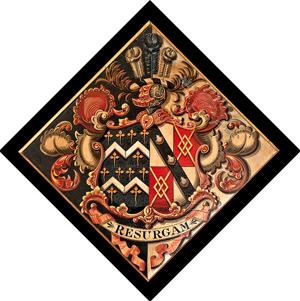 Although a family motto often appeared on a man's hatchment, it was often replaced by a Latin phrase relating to death and resurrection such as Resurgam ("I shall rise again"), In coelo quis ("There is rest in heaven"), or Mors janua vitae ( "Death is the doorway to life"). 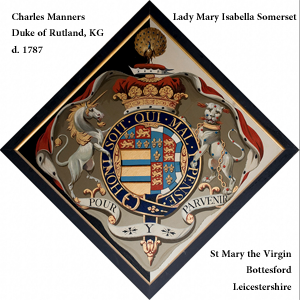 Many English parish churches contain one or two hatchments to a lord of the manor, or previous vicar. Some have great collections for a whole family: such as that of the Hulse family of Breamore, Hampshire or the Saltmarsh family whose hatchments reside in the Saltmarsh chapel at Howden in Yorkshire. 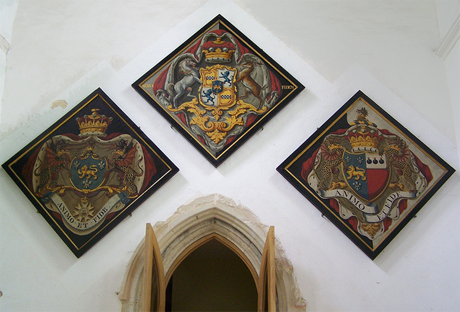 Hatchments have now largely fallen into disuse, but many hatchments from former times remain in parish churches throughout England. 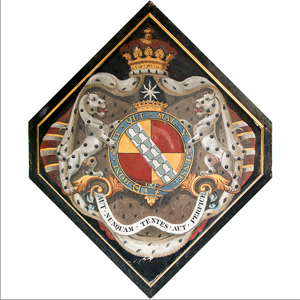 Hatchments were usually placed over the entrance of the armiger's residence, at the level of the second floor, and remained for from between 40 days and twelve months, after which they were removed to the local parish church. 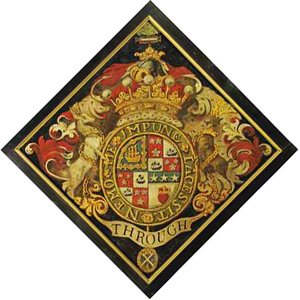 The practice developed in the early seventeenth century from the custom of carrying an heraldic shield before the coffin of the deceased, then leaving it for display in the church. 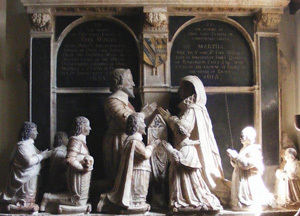 In medieval times, helmets and shields were sometimes deposited in churches and a few examples may still be seen in English parish churches. English h atchments can often be dated from their artistic style. For example seventeenth century hatchments often feature particularly ugly helms which were characteristic of the period. 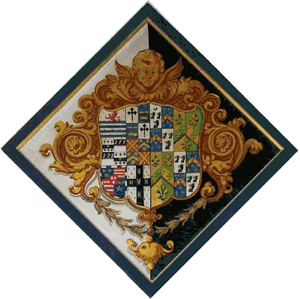 "I well remember seeing a hatchment fixed over the front door of the Earl of Powis' house on the west side of Berkeley Square, in 1891." "In 1925 a very old lady died in Eaton Square, London. The hatchment was hung over the front door. I was so impressed that I took a snapshot of it, feeling that I would be unlikely to see such a thing again." 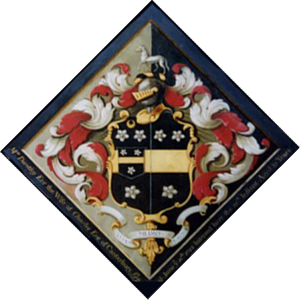 "On the death of the Rector of Exeter College, Oxford, in 1944, a hatchment was hung over the main gate of the College." 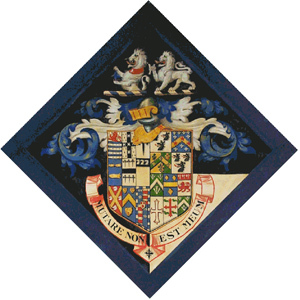 At the universities of Oxford and Cambridge it was usual to hang the hatchment of a deceased head of a house over the entrance to his lodge or residence. 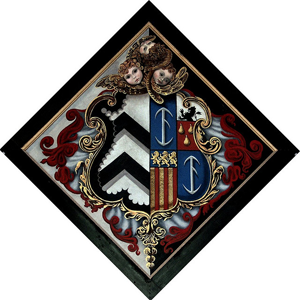 There is a fine collection of such hatchments at All Souls College in Oxford - the Wardens' arms each being impaled with the arms of the college. In the event of the death representing the 'end of a line' a death's head is displayed. A death's head is a human skull. In practice death's heads are used more freely. 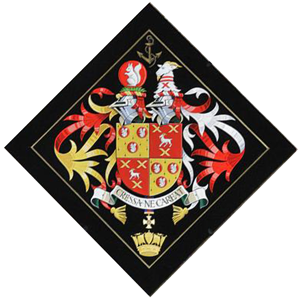 Hatchment of Charles Manners, 4rd Duke of Rutland, whose wife survived him. 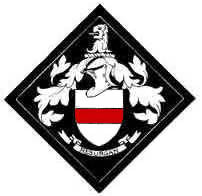 For a bachelor the hatchment bears his arms (shield, crest, and other appendages) on a black lozenge. 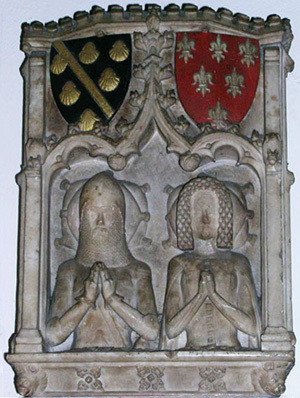 On the left are the fictitious arms of Mr Redfess who died a bachelor. 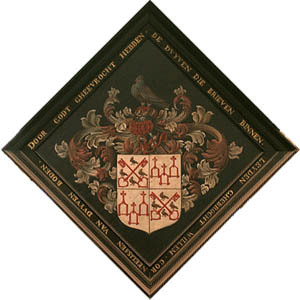 If the hatchment is for a married man, with a surviving wife, his arms upon a shield impale those of his wife; The dexter half of the background is black (the husband being dead), the sinister half of the background is white (his wife still being alive). On the right is a real example. The white background to the sinister side of the lozenge tells us that the armiger's wife survived him. 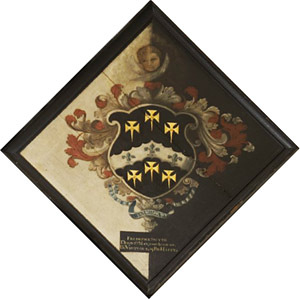 This hatchment is a little different - there is no crest, torse or lambrequin - just some decoration and a cherub. 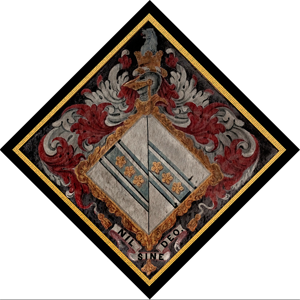 The arms represented on a lozenge, so we can assume that these the arms of a wife who died after her husband. For a wife whose husband is alive the same arrangement is used, but the sinister background is black (for the wife) and the Dexter background is white (for the surviving husband). 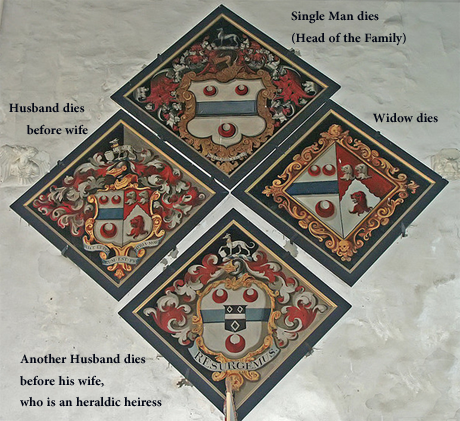 If Mrs Redfess, nee Bluechevron, had died first, but after her marriage, her hatchment would look like the one on the left. For a widower the same is used as for a married man, but the whole ground is black (both spouses being dead). When there have been two wives or two husbands the ground may be divided in a number of different ways. 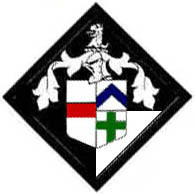 Option 2: The husband's arms remain in the Dexter half and the two wives have their arms in the sinister half, divided per pale, each wife having half of the sinister half. Option 4: The husband's arms remain in the Dexter half and the two wives have their arms in the sinister half, divided per fess, each wife having one quarter of the whole shield, one half of the sinister half. Option 2. The husband's arms remain in the Dexter half and the two wives have their arms in the sinister half, divided per pale, each wife having half of the sinister half. Hatchment at St Mary's, Ecclesfield, Yorkshire ??? 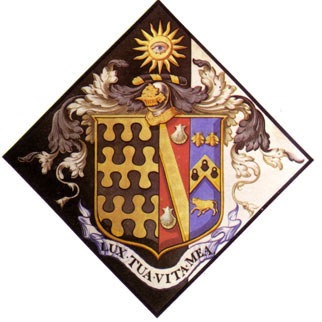 The Hatchment of a Widower whose second wife survives him. The options are much the same as the previous case, except that a patch if the background is white to indicate that the second wife is still alive. The white patch matches the background behind her arms. An Example of Option 2. St Mary's Church, Northiam, East Sussex, England. 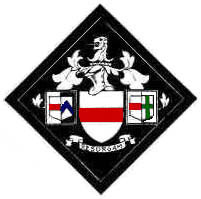 For a single woman, her arms are represented upon a lozenge with a black background. The principle is the same for any unmarried man. 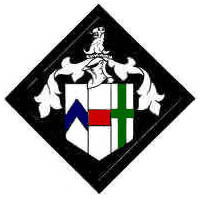 The hatchment on the right is for the second son and also bears a small crescent as a mark of cadency. Bishops and certain other office holders impale their own arms with those of their office. 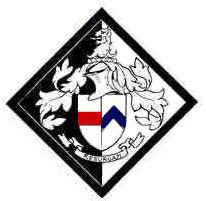 If Mr Redfess become a bishop and dies in office his hatchment will look like the one on the left. 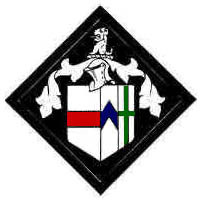 The arms of the bishopric are on the Dexter with a white background (the bishopric lives). 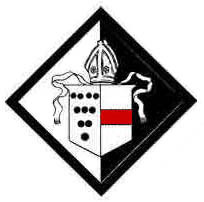 Mr Redfess's personal arms are shown on the sinister with a black background (since Mr Redfess is dead). Real examples are shown on the right. 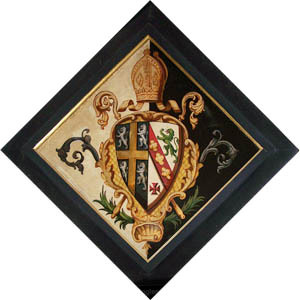 Hatchment to Edward Maltby, Prince Bishop of Durham. 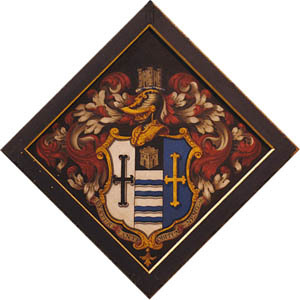 If the hatchment is for a married man with a surviving wife, his arms upon a shield impale those of his wife, and if she is an heraldic heiress her arms are placed upon an escutcheon of pretence (sometimes with crest and other appendages). The Dexter half of the background is black (the husband being dead), the sinister half of the background is white (his wife still being alive). 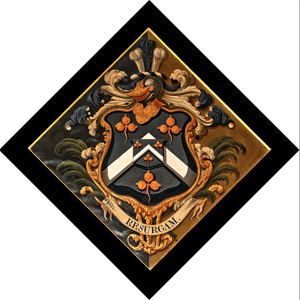 So if Miss Bluechevron had been her father's heiress, when she married Mr Redfess, his hatchment would look like the one above left. A read example is shown on the right. 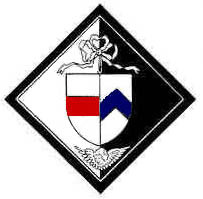 This is an unusual but perfectly correct hatchment.Henry Eve's arms were: Sable a fess or between three cinquefoils argent (Eve). His daughter Dorothy would have used the same arms displayed on a lozenge. When she married she brought her arms to be impaled with her husband's (on the sinister side of the hatchment). 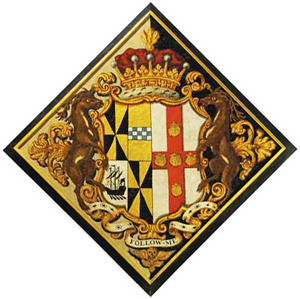 As an heraldic heiress her father's arms also appear in escutcheon on her husband's arms on the dexter side. 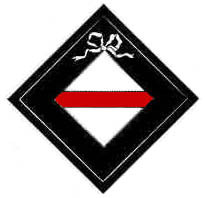 In this case she married into a cadet branch of the same family, so her husband's arms are identical, except for a crescent brissure used as a mark of cadency. Church of Saints Peter and Paul, Lynsted, Kent, England. The principles are exactly the same as for anyone else - though the appearance can be much busier because of the supporters, coronet, robes and honours. If Mr Redfess becomes Lord Redfess before his death, his hatchment would look like the one on the left. 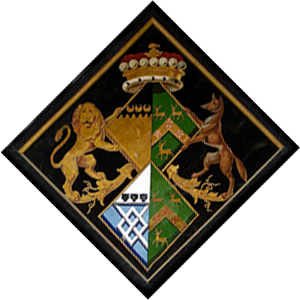 Hatchment of Charles Manners, 4th Duke of Rutland, whose wife survived him. This is tricky, and authorities differ where they mention the possibility at all. One option, shown on the right adapts one of the options for a man who has had two wives (and tells us that both husbands predeceased her). Another option is shown below. Hatchments provide a great deal of information, but they are sometimes confusing and occasionally seem to be impossible. Sometimes this is because of unusual family histories, and sometimes because of errors. Sometimes the impossibility results from a failure to use marks of cadency - so that men who married a cousin appear to have married their own daughter. Sometimes the interest lies in some artistic eccentricity. 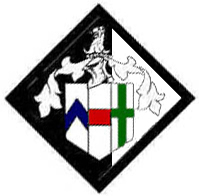 The arms suggest that a man has married his own daughter who was an heraldic heiress. More likely he married a cousin who was the daughter of the head of the family. The motto "sur le nez" means "on the nose"
What is happening here? The lozenges suggest women married to each other. 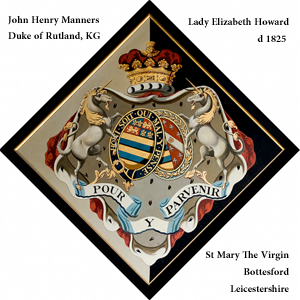 Perhaps this is a Baroness in her own right who married an Earl, and the Earl is given a lozenge just for a pleasing symmetry. 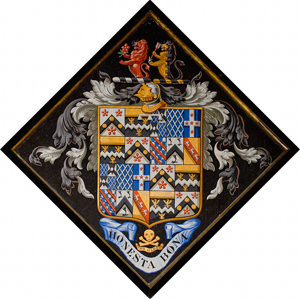 This is a hatchment of Charles Sackville-Germain, Duke of Dorset KG, who died unmarried. His titles died with him. 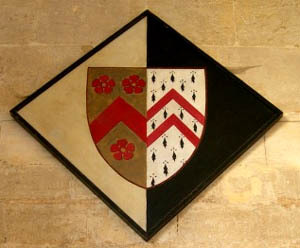 The hatchment rests in St Peter's Church, Lowick, Northamptonshire, England. The interest lies in the odd shape - was it truncated to fit a narrow space? What is happening here? 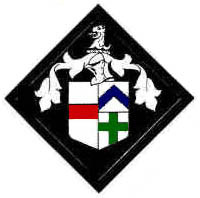 The arms suggest a woman of the Awdry family who married her own father - but in reality probably married a cousin. The interest here is the effect of party colouring not only the background but also the frame. 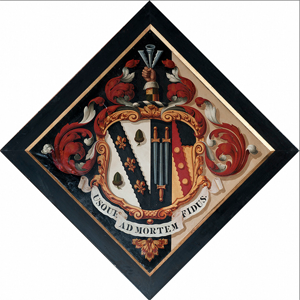 According to many sources the practice of raising hatchments as funeral monuments is long dead. A little research reveals that this is far from true. Here are a few examples. 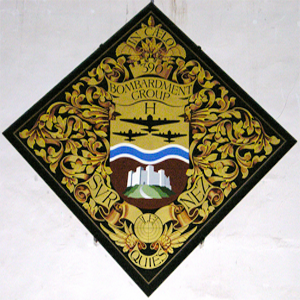 The hatchment commemorates Captain Joe Baker-Cresswell, who died in 1997. 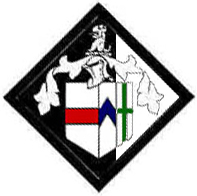 The hatchment features the Cresswell arms and motto, with the addition of Captain Baker-Cresswell's Distinguished Service Order medal. 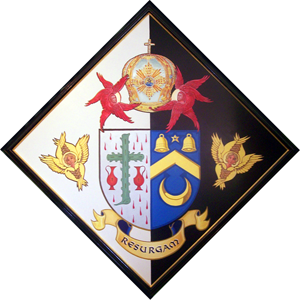 This hatchment was commissioned by Abba Seraphim, Metropolitan of Glastonbury of the British Orthodox Church within the Coptic Orthodox Patriarchate of Alexandria. As Abba Seraphim is still alive his currently hatchment hangs in his home in preparation for his funeral. Note the children below, including an infant. 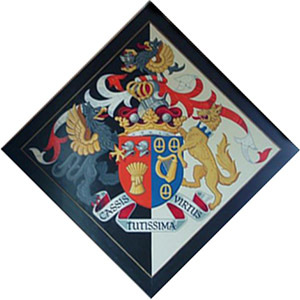 Only about fifty hatchments still exist in Scotland. This sparseness is due to in the mid 17th century Church of Scotland. 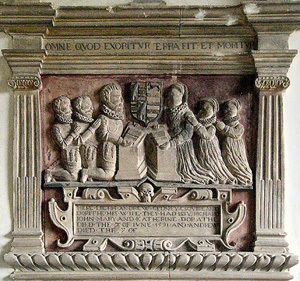 In 1643 The General Assembly the Church of Scotland passed an Act which prohibited 'Honours of Arms or any such like monuments'. "Att Grange, 19th December, 1649... the presbytry finding some pinselis in memorie of the dead hinging in the kirk, presentlie caused them to be pulled doun in face of presbytry, and the minister rebuiked for suffering to hing ther so long." 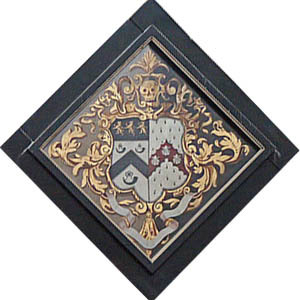 Scots hatchments do not follow in the sparse pattern that modern writers lay out for hatchments and funeral heraldry. They are often highly decorated with the coats of antecedents and with tears, skulls (mort heads), and mantles. 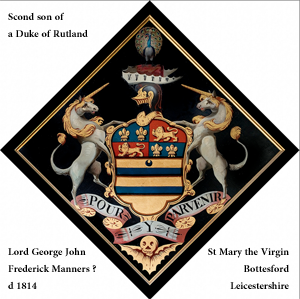 It is not unusual to place the arms of the father and mother of the deceased in the two lateral angles of the lozenge, and sometimes there are 4, 8 or 16 genealogical escutcheons ranged along the margin. 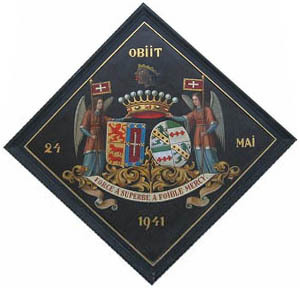 In the Netherlands hatchments (in Dutch, rouwbord, literally meaning "mourning shield") with the word "OBIIT" (Latin: "deceased") and the date of death were hung over the door of the deceased's house and later on the wall of the church where he was buried. 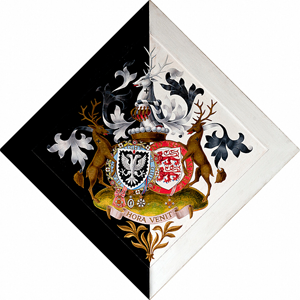 In the 17th century the hatchments were black lozenge-shaped frames with the coat of arms. 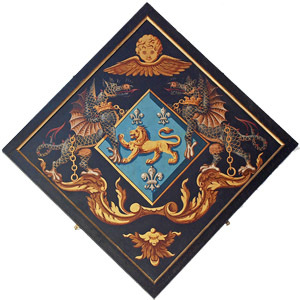 In the 18th century both the frames and the heraldry became more elaborate. 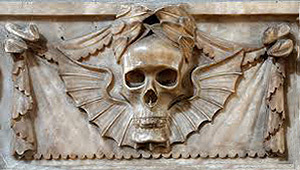 Symbols of death like batwings, skulls, hour-glasses and crying angels with torches were added. 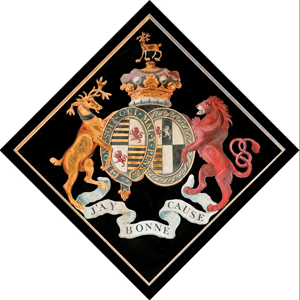 The names and arms of the 8, 16 or 32 armigerous forbears also featured - sometimes an invention by the nouveaux riches. 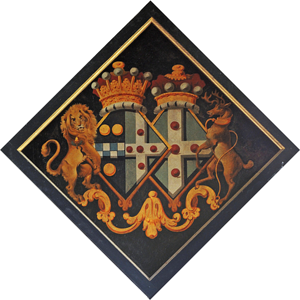 The British tradition of differentiating between the background of hatchments of bachelors, married men, widowers and others is unknown in the Low Countries. 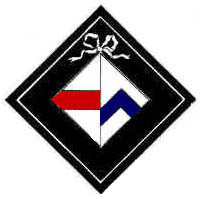 The arms of a widow are sometimes surrounded by a cordelière (knotted cord) and the arms of women are often, but not always, shaped like a lozenge. There were no Kings of Arms to rule and regulate these traditions. 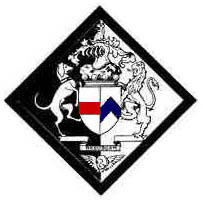 In 1795 the Dutch republic, recently conquered by revolutionary France, issued a decree that prohibited the use of heraldic shields. 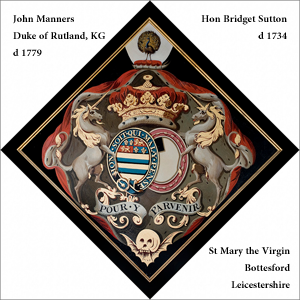 Thousands of hatchments were chopped up and burned. In the 19th. 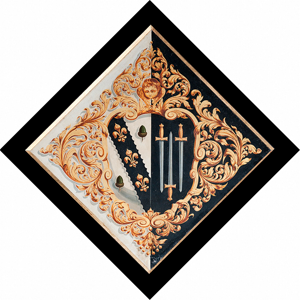 Century hatchments were almost forgotten and only a few noble families kept the tradition alive, though in Flanders, both noble families and the clergy of the Roman Catholic Church have kept up the tradition of erecting hatchments. 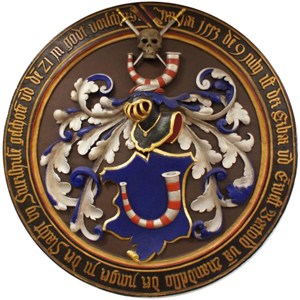 Unlike the British hatchments Dutch and Belgian examples are often inscribed with dates of birth and death, often the Latin words "obit", "nascent" and "svea" are used to give the dates of death and birth and the age of the deceased. 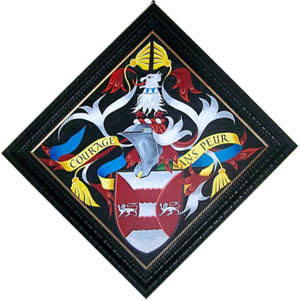 Name and titles are sometimes added along with the arms of ancestors. 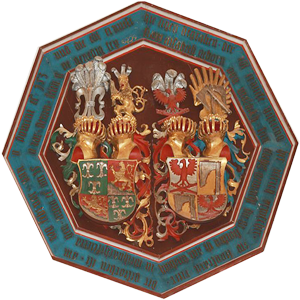 Sometimes the coats of arms of a man and a woman are shown on the same hatchment. 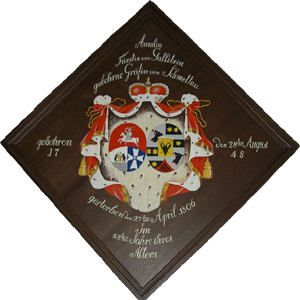 In Germany a totenschild (death-shield) is an approximate equivalent of a hatchment. 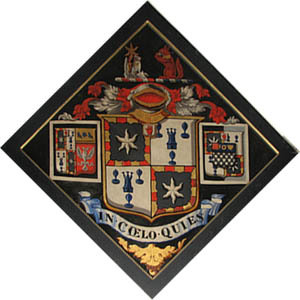 A totenschild is a memorial plaque for a deceased noble or bourgeois hung in a church or chapel. 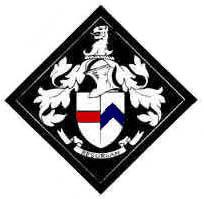 It recalls in heraldic form of arms and an inscription the life of the dead man. The custom had its heyday in the 16th Century and gradually declined over the next two hundred years, an epitaph on a monument of wood or stone, gradually taking over its function. The origins of the practice lie in the 12th century when the shield and helmet of a deceased knight was hung in his honour over his grave in his local church or chapel.. At first the knight's real shield was used rather than a painted replica. The few existing shields surviving from the Middle Ages owe their preservation mainly to the fact that they were hung well out of the way above the grave. In the Renaissance wooden replicas started to be used - sometimes circular, sometimes octagonal and occasionally rectangular. A single line inscription ran around the edge, giving the name of the deceased, the date of his death, and mention of his social position. In the Baroque period the totenschild became more magnificent. 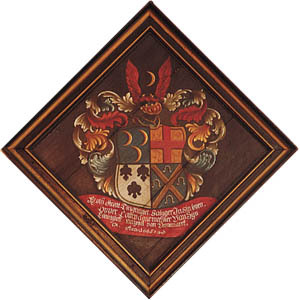 The coat of arms was no longer in the foreground, Instead the main features became the rich and varied design of the frame and various decorations - ribbons, scrolls and allegorical figures. The inscription was moved to a rectangular or oval field within the composition. The right to hang a totenschild was a privilege, originally reserved for the nobility. Later, the the privilege was extended to members of knightly orders and to patrician citizens of the city, but not clergymen. 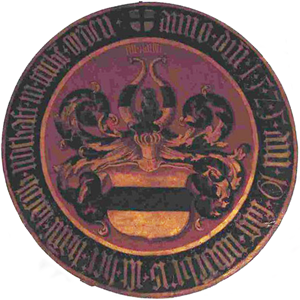 The arms of a woman occasionally appear on the shield of her husband. 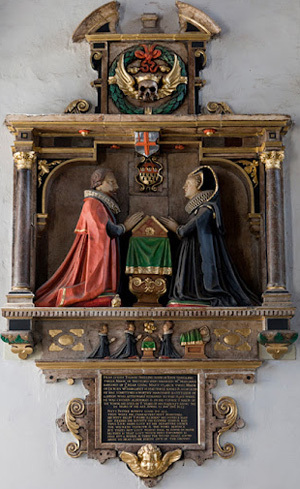 Not everyone entitled could not afford a funeral shield, because the cost of painting it and making the requisite donation to the church could be prohibitive. The National Museum in Nuremberg has a large collection of totenschilds as does the University Museum of Cultural History in Landgrafenschloss in Marburg.